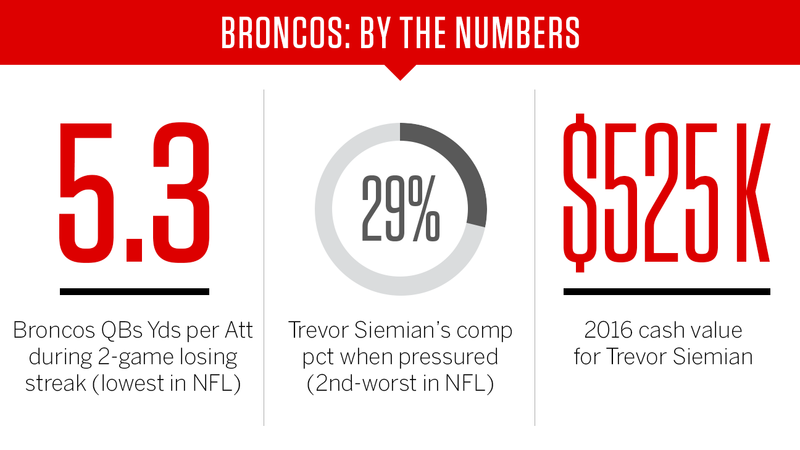 ENGLEWOOD, Colo. -- Trevor Siemian and Brock Osweiler certainly are in each other's quarterback timelines. Both are former Denver Broncos' draft picks. Osweiler was a second-round pick in 2012, the year of Peyton Manning's arrival, and Siemian was a seventh-round pick in 2015, the year that marked Manning's departure after a Hall of Fame career. They had lockers next to each other in 2015 and spent almost every football moment together during a season that ended with a Super Bowl title. And on Monday night, they will start against each other when the Houston Texans face the Broncos. Osweiler left the Broncos as a free agent in March for a $72 million deal and the chance to be the franchise quarterback for Houston. Siemian filled the vacancy, beating out Mark Sanchez and rookie Paxton Lynch to be Denver's starting quarterback. 2016 salary/signing bonus: $4,000,000, a signing bonus of $12,000,000 and a roster bonus of $5,000,000. 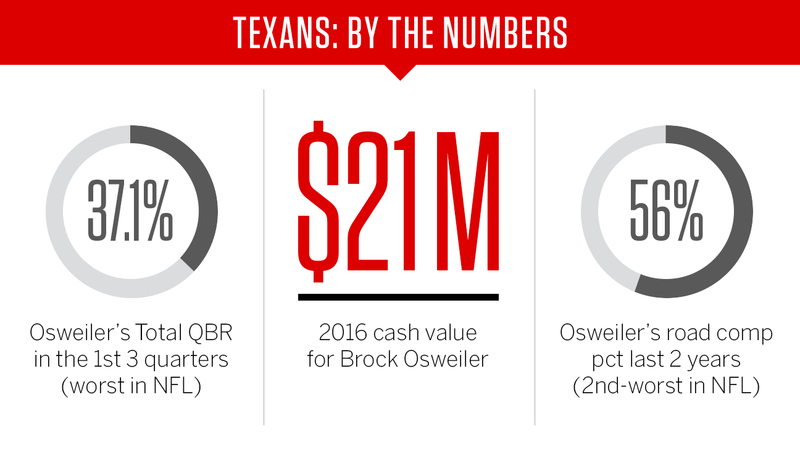 What he does best: Though Osweiler has had an inconsistent start on the field in his Texans career, the thing Houston coach Bill O'Brien constantly mentions is the way his quarterback prepares for games. Osweiler has said he keeps detailed notes of everything he learns and observes during the week, and that is paramount to his process leading up to games. That preparation helped Osweiler quickly earn the support of his teammates and the Houston coaching staff, due to how hard he has worked. "He's a very easy guy to coach," O'Brien said earlier in the season. "He's very hardworking, a good communicator. He asks good questions. He studies the night before, comes in the next day and has good questions about the plays that are going in that day." Where he needs improvement: Osweiler has thrown at least one interception in each of his six games this season. He has thrown eight interceptions in total, to go along with his eight touchdowns. He has mentioned his desire to finish with a clean game after almost every start, something he focuses on during the week. Some of those interceptions have come from forcing the ball to Pro Bowl receiver DeAndre Hopkins and from holding on to the ball too long. Osweiler said earlier in the season that he needs to make better decisions at the line of scrimmage, and that is the reason he is struggling in those situations. The Texans' offensive line played poorly early in the season; but in left tackle Duane Brown's first full game back from a quad injury on Sunday, the line played its best game of the season, and Osweiler was only sacked once. Osweiler will need to make quicker decisions in the pocket against an excellent Denver defense on Monday night. Best moment so far: Osweiler sparked a two-touchdown comeback in the final six minutes to force overtime and then led the Texans down the field to set up a field goal to beat the Colts on Sunday night. The overtime drive was highlighted by an impressive 36-yard pass to wide receiver Jaelen Strong that was "in a spot where the DB couldn't make a play," according to O'Brien. Osweiler struggled through three quarters, going 11-of-22 for 89 yards with an interception, before turning it around to go 14-of-17 for 180 yards and two touchdowns in the fourth quarter and overtime. Osweiler certainly still has improvement to make, but Sunday night was a step in the right direction. What he does best: Siemian keeps his composure in any and all situations. Broncos coach Gary Kubiak took the rare step in offseason workouts and training camp of splitting the work in practice equally among the three quarterbacks on the roster -- Siemian, Sanchez and Lynch. Kubiak said he tried to create as much pressure as possible to find the guy who would win the job. Siemian rarely, if ever, got rattled. Toss in a high-quality NFL arm and he was the clear winner. Where he needs improvement: Because he has kept his composure and has piles of confidence in how he throws and where he believes he can fit a pass, Siemian will take risks he should not. It has resulted in an ugly interception or two to go with some close calls that could have been touchdown returns if defenders had not dropped them; the Cincinnati Bengals dropped two interceptions in the Week 3 game alone. Siemian is undersized and needs to develop a willingness to ditch the ball rather than take punishment. He already has suffered a right shoulder injury in the preseason and a left shoulder injury in a Week 4 game against the Tampa Bay Buccaneers. Best moment so far: The résumé isn't that big yet. After all, his one snap in the offense in 2015 was a kneel-down against the Pittsburgh Steelers in December. He has made five starts this season; he missed one game because of his injury. But in a tilt during which the Bengals had effectively bottled up the Broncos' run game and challenged Siemian to beat them, he did just that. Siemian torched the Bengals' man coverage for 312 yards, to go along with four touchdown passes. He showed spectacular touch on the deep ball and the timing to get it to receivers in stride for the maximum catch-and-run plays.